On May 17th, the 7th Yiwu Auto Exhibition, which was hosted by CNAICO, Zhejiang Association of Automobile Manufacturers (ZAAM) and undertook by China National Automobile Convention & Exhibition Zhejiang Co., Ltd., successfully finished in Yiwu International Expo Centre. This was the first large-scale auto exhibition since Yiwu became the Experimental Area of International Trade. The exhibition was focus on internationalization, culture, leadership and service, attracting about 327 thousand audiences in the 4-day exhibition, selling 1576 cars which were worth 2300 million RMB, and making intention of 8901 cars. All of these had broke several records of Yiwu Auto Exhibition, such as the biggest scale, the highest level, the most brands, the best support, the richest culture activities, the most popular, the best seller and so on. The exhibition area and the amount of exhibitors topped the 7-year-history, and as many as over 60 brands had displayed their cars in the exhibition. Luxury car brands Ferrari, Maserati, Lamborghini, Bentley, Rolls-Royce, Porsche, Cadillac, Lexus, GMC, Land rover, Infiniti, Benz, BMW, Audi; joint venture brands FAW-Volkswagen, SGM, Dongfeng Nissan, Dongfeng Honda, GAC-Toyota; and Chinese brands BYD, Great Wall, Geely, Lifan, JAC, Dongfeng Fengshen all brought their newest and best cars, showing their strength of brand. As the Yiwu session of International Automobile Industry Exhibition Hangzhou China, Yiwu Auto Exhibition continued the operation mode of Hangzhou Exhibition, promoting the consumption concept of auto makes life more beautiful since the birth of Yiwu Auto Exhibition. During the exhibition, over 30 brands such as Audi and JAC displayed their new cars. Since 2006, Yiwu Auto Exhibition became the best place for people in Yiwu to buy cars, as its famous brand and big discount. The popular of this exhibition brought so many orders to the exhibitors, and it had been a good indicator, showing that the rigid demand of the market was still very big, and promoting the selling by the accumulation of potential customers. This exhibition also put emphasis on the publicity. The committee not only cooperated with the local media , but also used short message, banner, taxi LED to introduce the exhibition. What’s more, the committee even advertized around Yiwu, such as Dongyang, Pujiang, trying to introduce the exhibition to the whole middle-Zhejiang. The goal of the committee of Yiwu Auto Exhibition is to build it as the No. 1 auto exhibition brand of middle-Zhejiang. Next year, the committee would try their best to show the citizen of Yiwu the No. 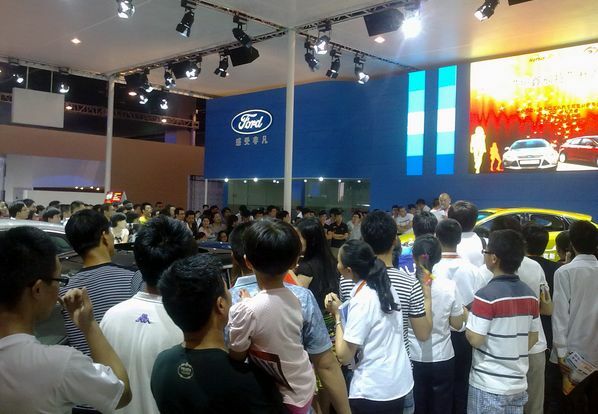 1 auto exhibition of middle-Zhejiang with higher level and standard.